Loreta is excited about her “NEW FIRST”, her FIRST public performance with her brother STANISLAV KOVACIC on cello. Please join us in ZAGREB, CROATIA, Loreta’s childhood hometown, on TUESDAY night, JUNE 18th 2019, at Kulturni Centar Mesnicka (KCM) in Mesnicka ulica 12. She will perform a selection of classical piano pieces and her own compositions. She will be joined by her dedicated THEREMIN PLAYER JOSEPH PARANI and a few more Croatian artists: singer MELITA LOVRICEVIC and others. Free event. Donations only. with Joe Parani on theremin, Stanislav Kovacic on cello, Melita Lovricevic backup vocals. There will be two more performances of ‘SPACE WIGGS” to follow: one at JANOWSKY ELEMENTARY and one at BURBANK MS.
ART CAR PARADE creative kid zone 2019 from NOON to 1 pm. Loreta and the Alchemist Piano Theatre with JOE PARANI on THEREMIN and Dominique German on drums will perform APT originals. cover songs and interactive improvisations. Join us on stage! Sing BOHEMIAN RHAPSODY, SELENA and ALIENS. 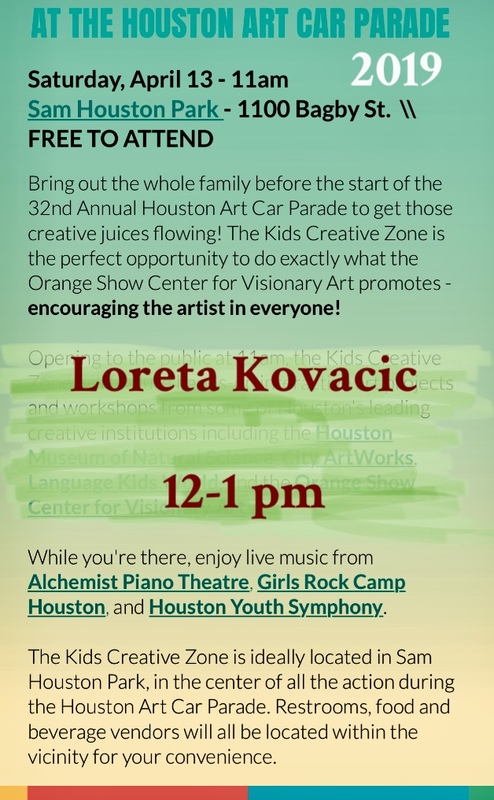 Loreta Kovacic and Alchemist Piano Theatre are performing at the ART CAR PARADE 2019. Loreta will be inviting you to join her on on stage. She will be performing original and cover songs with JOE PARANI on theremin and DOMINIQUE GERMAN on drums. Come and join her. Sing, improvise, join! — COME SEE THE SHOW! Year 2019-2020 marks Loreta”s “30 years in Houston” tour. She will be performing in Houston at the Art Car Parade, Discovery Green, the Duck etc. She will then travel to Louisiana and in June and July 2019 she will be on tour in Croatia with her brother cellist and composer STANISLAV KOVACIC. LORETA KOVACIC and the TEXAS SLAVS Joe Parani on theremin and Dominique German on drums. APRIL 13th 2019 in Downtown Houston at the ART CAR PARADE Kid Zone. Playing original songs, covers and unique interactive songs to celebrate the artist in all of us. Join us! Loreta will play her classical solo favorites from BACH, SCARLATTI, LISZT and GERSWIN. She will also perform a few covers and her original songs. THANK YOU ALL for coming and making this a great event! Thanks to all who came, friends and family tech and art support. Thank you Johnny, Maya and Joe! NEXT ORIGINAL APT SHOW " HELP SAVE EL OCEANO" WILL BE IN SPRING 2018 AT DISCOVERY GREEN HOUSTON. Alchemist Piano Theatre performs at Lights in the Heights every year. It’s been 20 years at the same location, 701 Byrne on the lawn. APT kids play piano and sing. People partake in Christmas singalong. Loreta Kovacic plays and sings a few of her originals. There is a party going on and this spot is one of the best in the Heights. Santa Claus is coming to Lights in the Heights! our next performance is for the ART CAR PARADE on APRIL 11th 2015, 11 am to 2 pm (the start of parade). Saturday in the KID ZONE, downtown next to Heritage Society on Allen Parkway and Bagby. It's LORETA KOVACIC on piano, voice and melodica, JOE PARANI on his home made theremin and props, SHANE LOUDER on drums. This is our interactive children's show, so if you want to sing, dance, perform, just come on over to the stage and let's talk. On October 11th, 2014, Saturday, from 11 to 3 APT will perform at ORANGE SHOW's Smither Park on 2401 Munger Street. We have been selected to provide music for this event. Loreta on keyboards, Shane on drums, Joe on theremin and four APT children singers will be entertaining families with a few cover songs, but mostly APT original songs and dances. Join us! There will be many other activities for kids, and Orange show is a magical place. You can find more info about our musical/theatrical program in the Menu: Alchemist Piano Theatre: APT children's show. Dr. Kovacic performed for croatian president IVO JOSIPOVIC on 5/15/14 at Westin Galleria Hotel. Organized by World Affairs Council of Houston. Dress up as Charlie and/or do the “Charlie walk” for a prize. Perfect for a family picnic and to introduce kids to the genius of Charlie Chaplin! Free. Dr. Kovacic writes children’s music for her Alchemist Piano Theatre.